Since its release in 2015, the DD-500 has become the go-to digital delay pedal for all types of musicians around the world. The Version 2 software update includes a huge number of enhancements—including many based on user requests—making an already-great pedal even more powerful and inspiring. Tape—An Echorec 2 type has been added to Tape mode, the RE-201 Space Echo type has newly added tape head parameters, and wow & flutter is now adjustable for all tape types. Dual—The two delays in Dual mode can now be routed in numerous series and parallel configurations. Filter—A touch-sensitive filter setting has been added. Slow Attack—The Slow Attack setting can now be applied to both the input and delay signals, and a curve setting has been added to adjust the attack time. Shimmer—Numerous enhancements, including a second pitch character type, stereo pitch mode, added Overtone type, and more. SFX—Phaser type added, plus enhanced parameters for tremolo mode. Pattern—Gate type added, enabling the creation of Slicer-style delay effects. Vint. Digital—Delay phase and feedback phase parameters added. Improved A/B Simul mode—More flexible routing and input/output options have been added, including series or parallel connections, the ability to process each input and output with separate patches, and more. Bi-phase modulation—Bi-phase is now available in addition to the standard single modulation setting, providing more spacious sound when used in stereo setups. Added tone-editing parameters—The DD-500 has always had a ton of tone-shaping parameters, and now there are even more, including feedback damp, adjustable EQ position, EQ hi-cut, and others. Feedback Loop function—This allows you to insert an external effect to process a delay’s feedback loop. Input and output gain—These levels can now be adjusted and saved per patch. Phrase Loop clear—The current loop can now be cleared without exiting Phrase Loop mode. The Version 2 update also includes enhanced control functions, additional MIDI parameters, and more. Check out the supplementary manual for full details on all the newly added features. Version 2 software is available in the Downloads section at the DD-500 product page. The DD-500 Editor software has also been updated to support the Version 2 features, and can be downloaded at the link above. 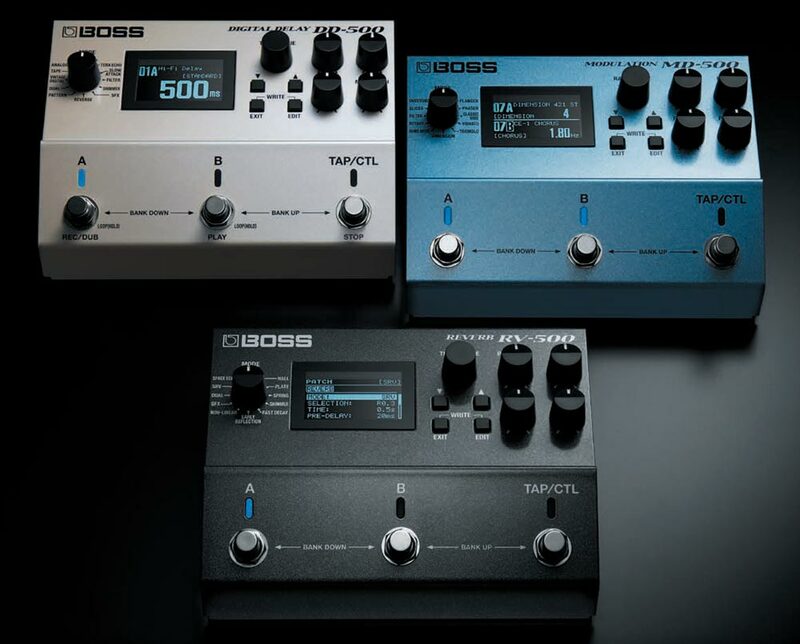 BOSS 500 Series: DD-500 Digital Delay, MD-500 Modulation, and RV-500 Reverb.